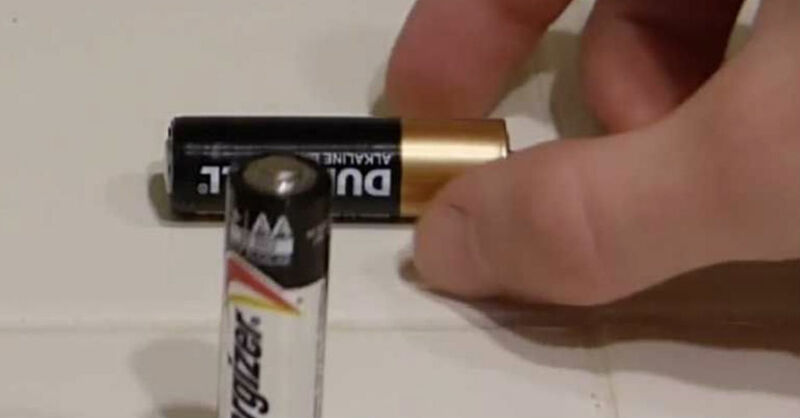 Many people have drawers or containers full of batteries, and it's not uncommon for people to have no idea if their common alkaline batteries are dead or alive. Trying the batteries inside electrical devices is often a pointless endeavor; the vast majority of electrical devices take more than one battery, and if only one battery is good, there is still no way of knowing which battery is fine as the device will still not run. A surefire way of testing a battery is through the use of an electrical meter, but most people don't have one in the house. Fortunately, even without electric gadgetry, there is a very easy way to tell if a battery is alive or dead--The Drop Test. The Drop Test involves simply taking any kind of alkaline battery and holding it with the negative side facing a solid, flat surface at a height of about one inch. The battery is then dropped straight down. If the battery lands with a solid thud and attempts to stay standing, the battery is good; if the battery bounces several times and falls over easily, the battery is all used up. This test works with AAA, AA, C and D batteries and helps save money and energy by giving non-technical savvy consumers a way to check their batteries with ease.